Here are simple, sample business attire policies for formal business attire, business casual attire, and casual business attire. Use the recommended policy most appropriate for your workplace. [Company Name] expects employees to dress appropriately in business attire. Because our work environment sees frequent visits from customers, clients, and the public, professional business attire is essential for our reputation. The formality of our business attire makes clients and customers feel that they can trust our judgment and recommendations. Proper business attire for men includes suits, sports jackets, and pants that are typical of formal business attire at work. For women, business attire includes pant and skirt suits and sports jackets appropriate to a formal business attire environment. Employees are expected to demonstrate good judgment and professional taste. Courtesy of coworkers and your professional image to clients should be the factors that are used to assess that you are dressing in business attire that is appropriate. We will deal with employees who wear business attire that is deemed inappropriate in this workplace on an individual basis rather than subjecting all employees to a more stringent dress code for appropriate business attire. [Company Name] expects employees to dress appropriately in business casual attire. Because our work environment serves customers, professional business casual attire is essential. Customers make decisions about the quality of our products and services based on their interaction with you. Consequently, business casual attire includes suits, pants, jackets, shirts, skirts and dresses that, while not formal, are appropriate for a business environment. Examples of appropriate business attire include a polo shirt with pressed khaki pants, a sweater and a shirt with corduroy pants, a jacket with a skirt or slacks and a blouse or a sweater with a skirt or pants. Pantsuits and sports jackets also fit the business casual work environment if they are not too formal. Jeans, t-shirts, shirts without collars and footwear such as flip-flops, sneakers, and sandals are not appropriate for business casual attire. Employees are expected to demonstrate good judgment and professional taste. Use courtesy towards coworkers and your professional image to customers as the factors you use to assess whether you are dressing in business attire that is appropriate. [Company Name] expects employees to dress appropriately in business attire of a casual nature. Our work environment for employees encourages employees to dress comfortably for work. Please do not wear anything that other employees might find offensive or that might make coworkers uncomfortable. It includes clothing with profane language statements or clothing that promotes causes that include, but are not limited to, politics, religion, sexuality, race, age, gender, and ethnicity. Employees are expected to demonstrate good judgment and professional taste. Courtesy towards coworkers and your professional image to coworkers are the factors you need to use to assess whether you are dressing in business attire that is appropriate. We will deal with employees who wear business attire that is inappropriate in this workplace on an individual basis rather than subjecting all employees to a more stringent dress code for appropriate business attire. These simple, sample dress code policies that specify business attire at work are provided as guides for your customized policy development. Depending on your workplace culture, you may not want more detailed policies. Since fewer policies, and more simple policies, are always encouraged whenever possible, these simple dress codes for business attire may serve you well. An acknowledgment form of the dress code may also be a useful tool for you to use. You are encouraged to use policies as guidelines for your many functional, contributing employees. The few that aren't? Deal with them individually rather than subjecting your entire workforce to detailed, stringent policies they don't need. 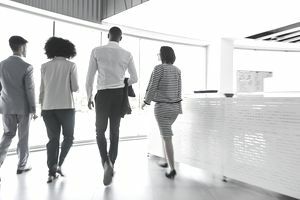 Your employees will thank you since too often policies are put in place because of the actions of a few employees—not the appropriate behavior of the many.